Newton is an outstanding moment of inspiration. A luxury statement piece created in order to fulfill the needs of our clients that are looking for the best in contemporary furniture design mixed up with luxurious details and high-quality materials. Newton free stand washbasin is a standout piece of international desire that dis-tinguishes itself from all the other designs by its futuristic forms. 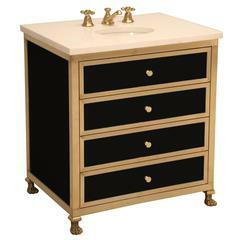 A vanity bath vessel in a matte black/dark charcoal grey and gold ceramic by L'Objet. Piece measures: 3" diameter x 3.75" height. 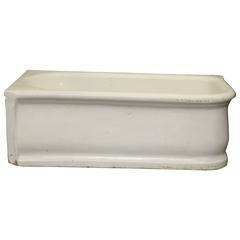 1915 earthenware bathtub with slightly bowed and footed detail. Right corner design. This can be viewed at our 400 Gilligan St warehouse in Scranton, PA.